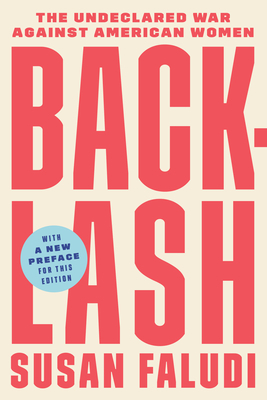 Though the 1970s saw great gains for American women, Backlash focuses instead on the 1980s, a decade revealed through Faludi's reporting as fraught with subtle anti-feminist agitprop and an escalating culture war that enlisted consumerism, mass media, and politics to warp the message of feminism and roll back the gains earned by 1970s activism. The work suggests that those unwilling to learn from feminist history will stumble blindly through its darkest chapters. No less relevant in our own time, Backlash persists as one of the most essential pieces of journalism for understanding the importance of the women's movement in America. From the author of In the Darkroom, a feminist classic and skillful examination of the attack on women’s rights. Today’s political climate leaves no doubt that American women are still being assaulted by the same antifeminist backlash messages that Susan Faludi brilliantly exposed in her 1991 bestseller. When it was first published, Backlash made headlines for puncturing popular media myths like the “infertility epidemic” and the “man shortage.” The statistic-defying, willfully fictitious coverage, Faludi pointed out, contributed to an anti-woman backlash. The fifteenth anniversary edition, with an updated preface by the author, brings backlash consciousness into the 21st century. Faludi’s words seem especially prophetic in post-Trump America. That glass ceiling remains unshattered, women are still punished for wanting to succeed, and reproductive rights are still hanging by a thread. But Backlash is an alarm bell for women of every generation—waking us up to the dangers that we all face. A former Wall Street Journal reporter, Susan Faludi won the Pulitzer Prize in 1991 for explanatory journalism and the National Book Critics’ Circle award for Backlash. She is the author of Stiffed: The Betrayal of the American Man, which was published in 1999, and has written for many publications, including The New Yorker, The Nation, Newsweek, and the New York Times.